What would you expect to be caught in an 80-foot-wide spider web? Birds, bats, maybe a hobbit or two? 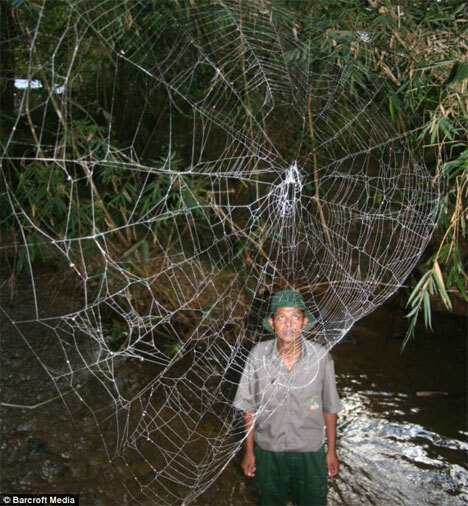 These massive spider webs, discovered hanging over a river in Madagascar, were made by an arachnid called Darwin’s bark spider – and surprisingly, they are only used to trap the standard spider fare: small insects. 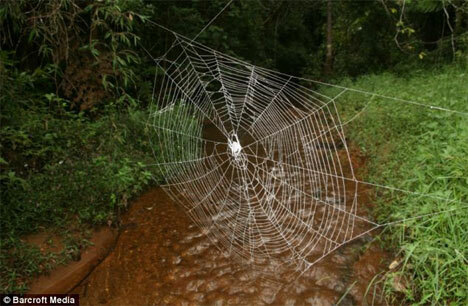 These webs are the largest in the world made by any single spider. 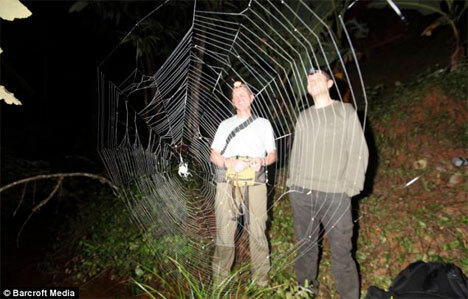 The freakishly huge webs are impressive not only because of their size, but because they are made of the toughest biological material ever discovered. The silk produced by Darwin’s bark spider is 10 times tougher than Kevlar and more than twice as tough as any previously discovered spider silk. Researchers think that the evolutionary reason for the toughness may have something to do with where the webs are built: over rivers. The silk has to be tough so that it doesn’t break and fall into the water, ruining the spiders’ work and washing away their meals. The spider that creates these crazy webs is only found in one place in the world: the island of Madagascar, off of the southeastern coast of Africa. The web builders of the species are almost exclusively female, though juvenile males also sometimes engage in spinning webs. Scientists hope that by studying the way the Darwin’s bark spider makes its webs we can begin to understand the complex mysteries of spider silk. See more in Earth & Nature or under Science. September, 2010.